Believe it or not, this recipe comes from OnHealth, which is my grandma’s PPO newsletter. My grandma was flicking through and landed on a couple of recipes at the back, one of which was for satay chicken which she had never had before. We decided to make it and off we went to Costco. After much sample munching, we bought – please don’t judge me – the biggest bag of frozen chicken breasts you have ever seen. Then we toddled on home and made preparations for marination. The marinade took minutes to make and, because the chicken breasts were still frozen, we put them into the marinade whole. 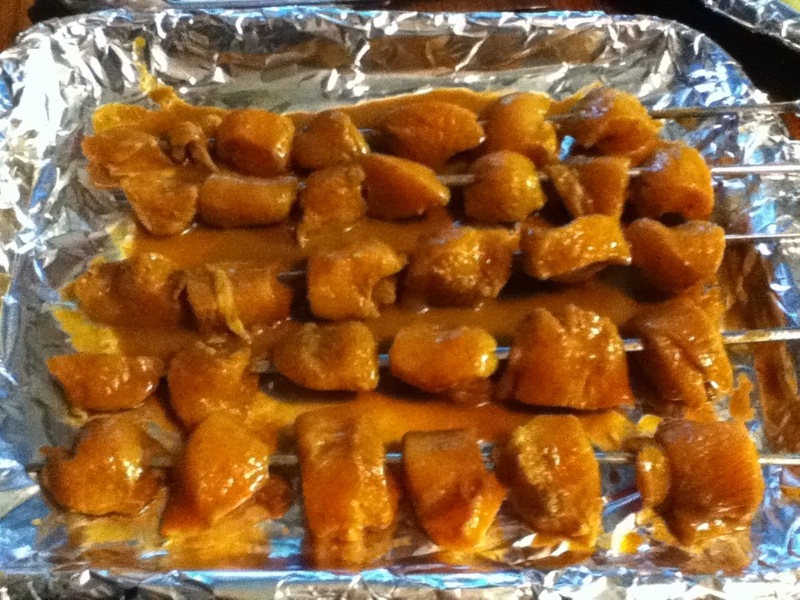 Once thaw, I removed them and cut them into one-inch chunks and replaced them in the marinade. We managed to marinate the chicken for about three hours, some of which was defrosting time, but the recipe recommends overnight. Then the magic happened. My mom and grandma had to jet off for an appointment leaving me alone, in the kitchen. Did you hear me? Free reign, in my grandma’s kitchen. It was a miracle. I was flipping through Light and Easy, the new super special Bon Appetit/Gourmet/SELF super magazine I had also purchased at Costco (for $3 off the newstand price), looking for inspiration when I came across a stone fruit slaw with a rice wine vinaigrette which also included a 1/4 teaspoon of curry powder. 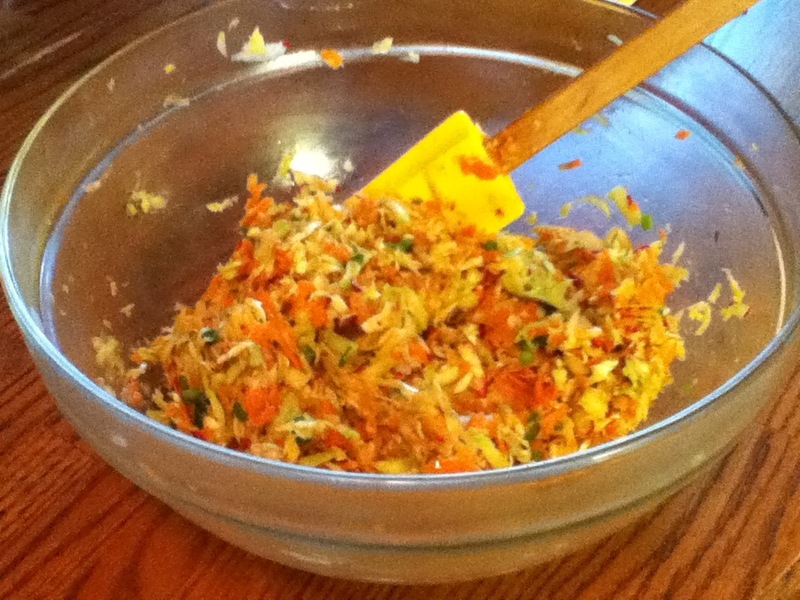 It sounded great and the curry powder in the dressing would mimic the curry powder in the satay marinade, but I didn’t think the family’s experimentation would stretch as far as shredded fruit with a savory dressing, so I decided to make it with shredded vegetables instead. I used broccoli (stalks only), carrots, radishes, green onions and celery root and I used sesame oil in the vinaigrette (and doubled the entire recipe) because, while this would’ve overpowered the fruit, the vegetables needed a bit more oopmh. I’m not totally convinced about the celery root in there, I had never used it for any Asian-type dishes before and I wouldn’t say it was a miserable failure, but it wasn’t a resounding success either. Maybe something like jicama would work better? 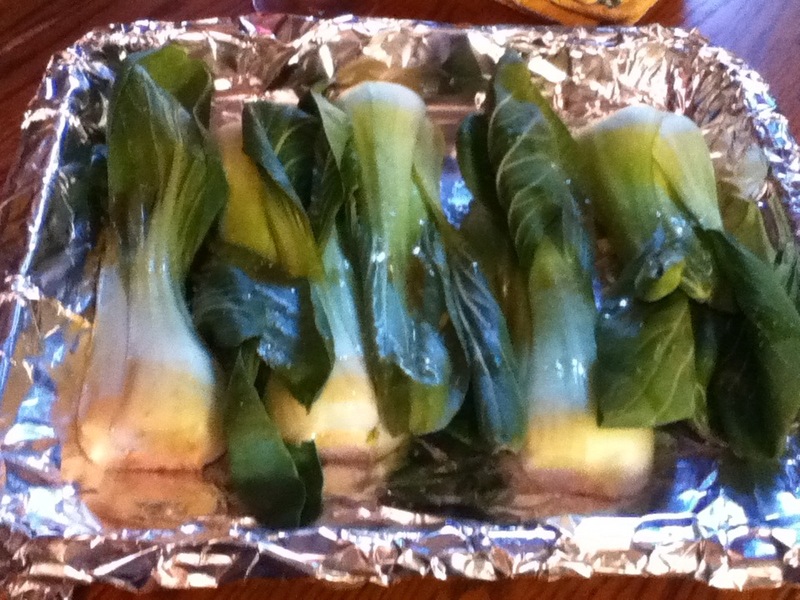 The second side is one of my favorite things ever: grilled bok choy. A simple drizzle of sesame oil, salt and pepper and you’ve got yourself a side dish. It tastes even better with Korean BBQ sauce, but I thought in this case that would be competing with the satay sauce – so simple and straightforward it had to be. About 10-15 minutes on a medium grill, then sliced up and voila! Another drizzle of sesame oil wouldn’t go amiss either. 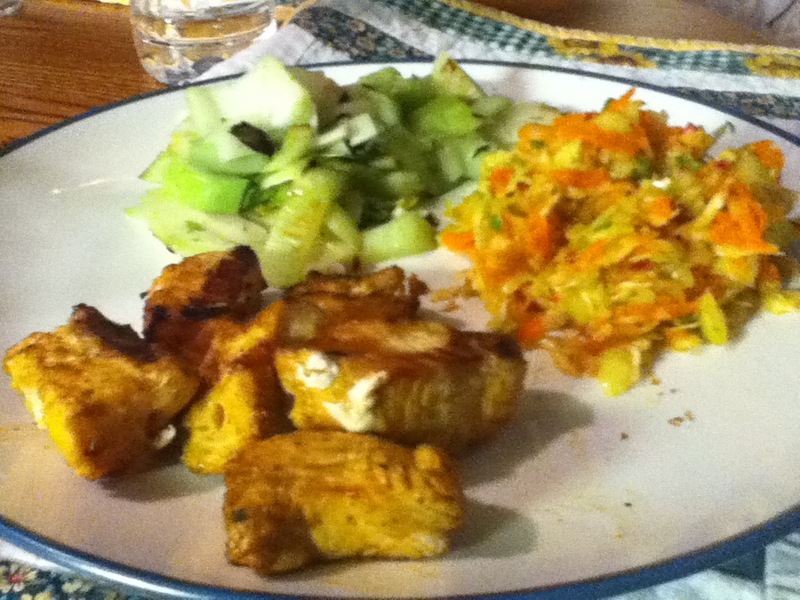 Everyone was impressed with the popping flavors of the chicken and the vegetable salad and the bok choy which all complemented each other really well. Also, the only fat in the whole dinner is the small amounts of sesame oil and the peanut butter in the marinade. The rest is all vegetables and lean protein! I bet this would work equally well with tofu – or definitely beef or pork too. It was so tasty, really satisfying and healthy to boot! Who knew a PPO newsletter could inspire such a flavorful dinner! 1. In a mixing bowl combine the first seven ingredients and whisk until smooth. 2. Place the chicken in the marinade and refrigerate for at least 2 hours, but overnight is best. 3. Skewer the chicken, leaving about 1/4-1/2 inch between pieces. 4. Preheat grill to medium high heat. Looks perfect for someone on a diet – like me. It definitely would be! It was so tasty though, you won’t feel like you’re on a diet.